Let’s start with this: I’m not a chocolate tempering master or god. It would be great to be one, because that would make my amazing job go a lot smoother. If you have ever tempered chocolate, then you know that it’s tricky business. At Dandelion, we’ve learn a lot as we go, and because others have helped me understand this whole process, I thought I’d share what I’ve learned. What I’m about to write is from my personal experience, including my failures and those few times I have actually succeeded. Before I joined Dandelion, I worked for a huge chocolatier making confections. That was my first job here in US, after moving from Guatemala, and among all the new words I was learning at the time, ‘temper’ was one of them. My supervisor used to use the word in nearly every single sentence, but I didn’t exactly know what he was trying to say. I associated the word with the fact that we were decreasing and increasing the temperature of huge tanks of about 200 or more pounds of “Belgian” chocolate. My tasks were also obscure; bring the chocolate up to 80°F (~27°C), then down again between 86 (30°C) to 89°F (32°C) degrees. Then, do a test with the temper meter and if the reading was in the appropriate range, I was allowed to open the valves so the chocolate could start circulating around the pipes. That’s pretty basic and kind of covers the whole process but there’s a lot more behind that simple and innocent word: temper. Structurally and chemically speaking, the fat (read: cocoa butter) in chocolate can exist in six crystal forms and most of them are unusable when it comes to making finished products, like truffles or chocolate bars. The point of tempering is to establish the crystal structure we want by changing the temperature of the chocolate in phases. Let me explain. Forms 1 (I) and 2 (II) are crumbly in texture and to the bite. The snap is non-existent and the chocolate melts easily, almost too easily. Forms 3 (III) and 4 (IV) will have a good snap and the texture will be more consistent, but then the appearance will be a little dull or matte and will still melt too quickly on your hands or in your mouth. Form 5 (V) crystals are the crystals we are looking for. This form of crystal will maintain its quality and structure over time, giving the chocolate a nice glossy finish and the firm snap we’re looking for. The chocolate will melt around body temperature. It is said that when chocolate is in good temper, you feel a nice cooling sensation in your mouth. This sensation happens because some of the crystals present in the cocoa butter (a natural fat found in cocoa beans) melt just below our body temperature, and the phase change from solid to liquid absorbs some of the mouth’s heat energy. Form 6 (VI) crystals have a higher melting temperature and only form when a chocolate in Form 5 (V) has been left for a long time—in our experience, at least a year. At that point, the crystal form actually shifts to Form 6 (VI). So, now you’re probably wondering how you reach this type of crystal. Remember that range I mentioned in the beginning? That’s part of how you do it, but it is not as simple as it looks. There are many other factors involved. The tempering process starts with warm, or as we sometimes call it, molten chocolate. I usually start somewhere around 105°F (about 41°C), but some people will suggest starting above 115°F (46°C) just to be sure you’ve melted all of the crystals out. At this point, the chocolate will be liquid due to the fatty content of cocoa beans, cocoa butter, being fully melted. In this first step, most of the crystals are melted and non-fat particles—meaning particles that are not cocoa butter— are floating all over the place haphazardly without structure. Next, I would decrease the temperature to somewhere between 80°F (27°C) and 82°F (~28°C). At this temperature, the chocolate will start becoming more viscous because the crystals have begun to form structures; some weak (Forms I-IV) and some strong (Form V). 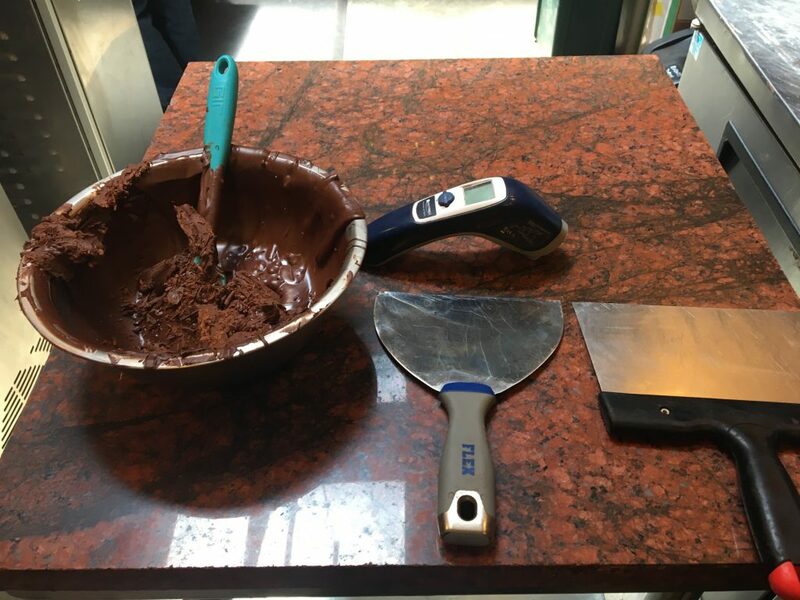 From this step onwards it is absolutely necessary to continuously stir the chocolate for two reasons: a) stirring promotes the growth of crystals and b) it helps to keep the chocolate from growing the wrong sort of crystals too quickly (in other words, solidifying). To get rid of those weak structures that developed while the chocolate was cooling, we raise the temperature back up again to 86°F-89°F (30°C-32°C), depending somewhat on the origin of your beans. This will help to melt the weak crystals off and, if done right, crystal Form V will largely prevail among the other crystals and the chocolate will be considered in temper. This works because every crystal type has a different melting point. In the process, you’re melting everything, then allowing a few types to form as the chocolate cools, and then remelting every type except Form 6 (VI) which, you’ll remember, only forms when chocolate in Form V sits for a matter of months. I usually think about tempering like opening a new set of assorted building bricks where you have strong and weak bricks. In my head, these bricks (crystals) are in a big bucket (bowl) without organization and without structure (molten chocolate). To start building, you will need to organize them (crystallization) and remove the weak bricks (raise temperature) . By the time you finish you will have a nice solid structure of the organized, stronger bricks (Form V). The ambient room temperature also plays an important factor in how easy or difficult tempering can be. Some people say that a good ambient room temperature for tempering is around 70°F to 72°F (21°C to 22°C) with 40% humidity, maximum. Sometimes, due to our open space, we have to tweak our tempering temperatures according to the weather. If it is cold and rainy we know the chocolate will start solidifying on us faster. If it is sunny and looks like the perfect day to be at the beach, we will probably be struggling trying to get the chocolate to stay cooler. And then comes the ingredient factor. Our chocolate has only two ingredients (organic cane sugar and cocoa beans) which makes our chocolate a little different, not only in flavor, but it also drastically changes the way we handle it and temper it. Our chocolate varies in thickness according to where it comes from—the further from the equator, the lower the fat content of the bean, and the higher the viscosity. For example, our chocolate from Madagascar is more viscous than our chocolate from Mantuano, in Venezuela. This is the reason we can’t temper all our origins at the same temperature.We can’t lower the temperature too much on an already viscous chocolate because it will crystallize faster, so we will keep it warmer and lower the temperature on a runny chocolate. I guess this is the main difference when it comes to our chocolate. Our chocolate is often more viscous than the chocolate in pastries, the culinary world, or even other chocolate maker’s bars because many of them add cocoa butter or lecithin, and other ingredients that keep the chocolate thin and runny, and easier to temper. Although my team uses a tempering machine, most of the time it’s not a walk in the park. Our tempering machine holds 25 kilograms, and works in three stages; keeping the temperature high on the first stage, lowering it on the second, and finally rising it on the third stage. The chocolate is transported from the bowl through a cooling column with an auger that works like an Archimedean Screw. After this cooling column there’s a pipe where the chocolate is heated again and it comes out “almost” in temper. Why almost? If there’s something I have learned through the years is that you can not rely completely on a machine. I talked to you about the three stages, but our machine only uses two of those. That’s partially because our tempering machine is so complex (with so many settings we don’t use) and partially because there’s little to almost no instructions on how to operate it.There’s also the weather factor that pushes us to adjust our settings from round to round of tempering (we do two to three rounds a day, making about 600 to 700 bars on average). Due to all these challenges, my teammates (more like family) have learned to temper and “fix” it, which to us means recovering the chocolate either from over crystallization (over temper) or falling out of temper. There are still times when we are unsuccessful and need to call the tempering round to an end. We have learned so much together that we have a really strong team, who genuinely care that you have the best experience possible when eating our chocolate. So, the next time you visit us and watch us work, cheer on the guys tempering (besides, we love to see you around and answer any questions you might have). Recently, we were encouraged to start learning a new skill: hand tempering. This skill is pretty much an art, and it takes knowledge and patience to master it. While the machine uses all sorts of electronic components, hand tempering requires bowls, offset spatulas, regular spatulas, thermometers, and a marble slab. The general process is the same (melt the crystals, let them form, melt out all but Form V), but hand tempering takes a whole different kind of skill set. We only hand temper sample batches because if we attempted to hand temper all of our chocolate, it would take us forever to produce the number of bars we produce today. 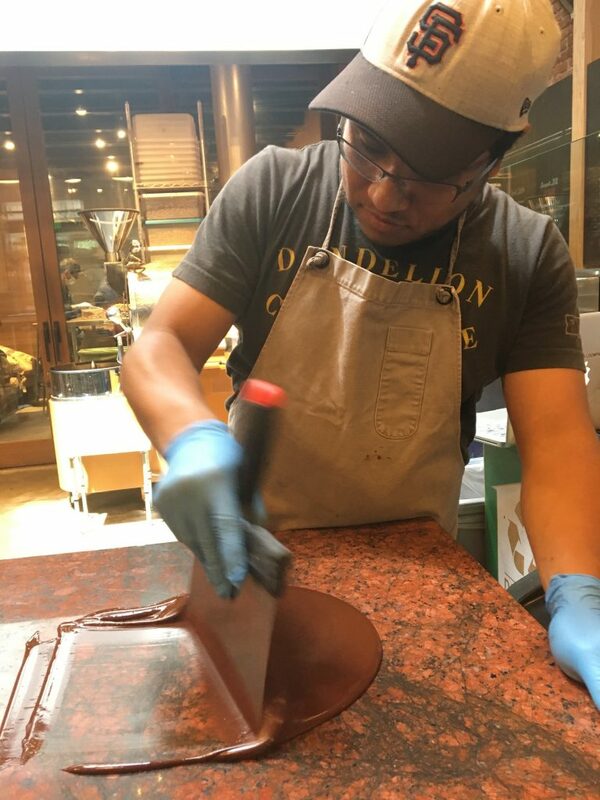 To do it, we pour molten chocolate on a marble slab, scrape it around with a metal bench scraper to encourage the crystals to form, and then mix it with a small amount of molten chocolate to warm it up again, melting everything but Form V. Personally, I like the hand tempering process. Although it can get a little messy, it feels more personal, challenging, and even if 90% of the time you won’t get it right, when you do, you get that feeling of accomplishment that makes you smile from ear to ear. So, overall, tempering is really challenging because you need to be as precise as possible, butIs it worth attempting? YES. Your chocolate not will only look better and be more enticing, but it will take your mouth on a different, slow-melting flavor journey. 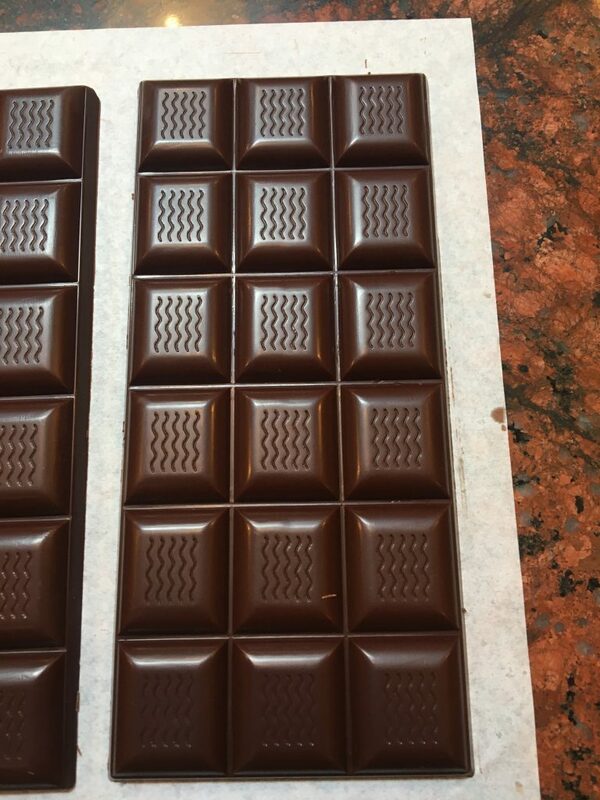 If you’re interested in learning more about tempering, pre-order our new book Making Chocolate, or stay tuned for our newest class all about tempering! Elman Cabrera, one of our lead chocolate makers, developed the flavor profile (i.e. 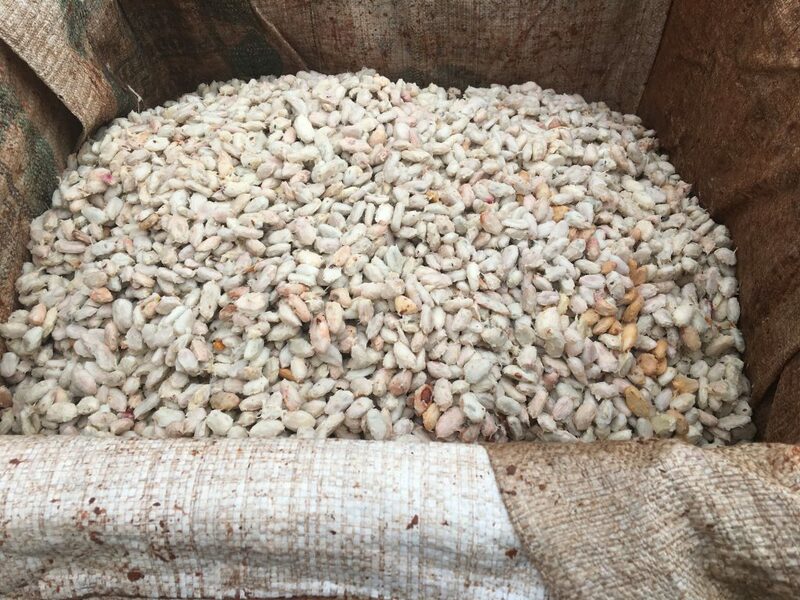 bean roasting parameters, and more) for the newest harvest of beans from Maya Mountain Cacao, Ltd. In his previous post, he writes all about that process. 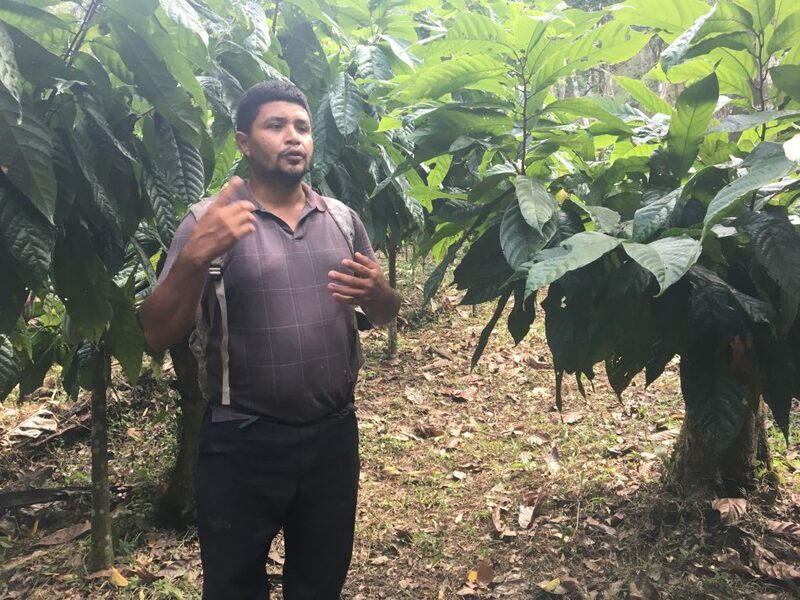 In this one, we get to hear about his experience traveling to origin, Belize, to meet the folks at Maya Mountain Cacao Ltd. who helped produce these beans. Working with Belizean beans that came from so close to my home in Guatemala was a thrill for me, especially because those beans from Maya Mountain were so delicious, and filled with such flavor possibility. I thought my time with them would be finished once I’d honed in on roast profile that we loved, but I’d soon find out the excitement had only just begun. The real blessing came when I was offered an opportunity to travel to the source. The annual Maya Mountain Farmer’s Meeting was taking place in Punta Gorda, Belize, at Maya Mountain Cacao, Ltd. on January 28th of this year, and when Karen and our Chocolate Sourcerer, Greg, asked me if I wanted to go, I packed my bags in a flash. Thinking about the opportunity of traveling to a country close to mine, about the adventures, and the privilege of visiting an origin—the origin whose beans I’d worked with—was too exciting to even describe. Obviously, my trip was so much more than all those things. 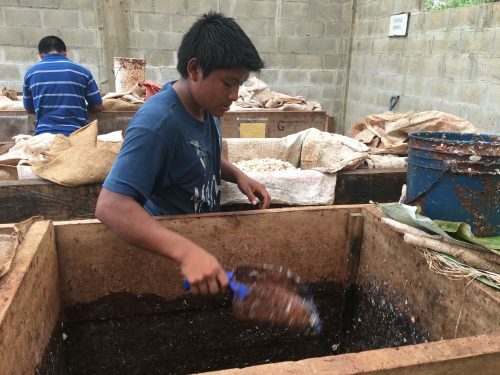 Throughout the time I was making test batches and running taste test after taste test, I had been digging into the story of Maya Mountain Cacao, Ltd., the social enterprise and fermentary that supplies those beans. I revisited our sourcing report and through some more research, learned some eye-opening things about how MMC helps and supports the farmers they work with, most of whom are Q’eqchi or Mopan Maya—a detail that really hit close home for me. 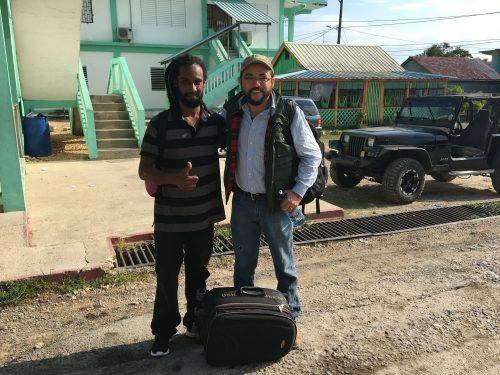 Rupert Smith (left, Operations and Quality manager of a Cocoa Farm) and Roy Fraatz (right, Fermentation Technician at Cacao Verapaz) ready to leave Punta Gorda. During fermentation the beans stay in wooden boxes, after a few days they get moved to another box to keep fermenting. Once in Belize, I met Emily (co-founder of MMC) and Minni (manager of MMC). The meeting—an annual gathering of all the farmers Maya Mountain works with—is an opportunity for MMC to communicate its values and goals to those farmers, and reestablish their commitment over the long run. At the meeting, MMC promised to stay in the market for many years, and committed to paying a fair price and buying the farmers’ cacao no matter the fluctuations of the market or competition that crops up in Belize. 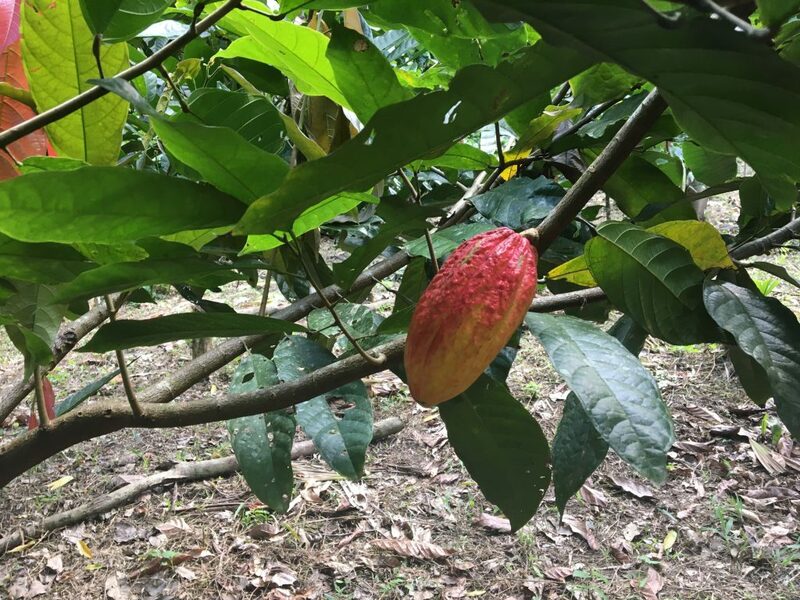 Maya Mountain was founded with the vision of creating access to the craft chocolate market for smallholder Belizean cacao farmers; they work directly with both parties which not only guarantees a high quality cacao, but it also means the farmers are getting a high price for it. Ermain Requena happily sharing his knowledge about cocoa farms. 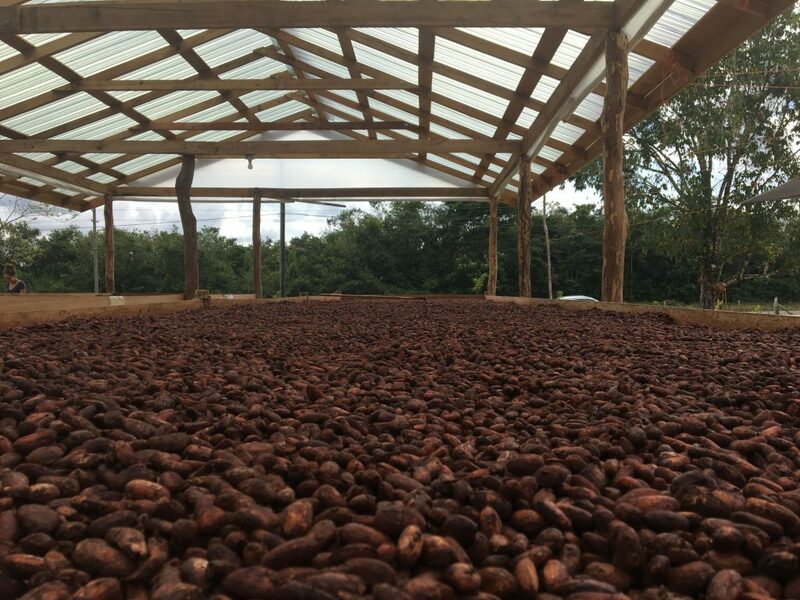 His work and the work of other farmers is giving results, just look at those beautiful cocoa threes. I met many of the farmers, and visited a cocoa farm for the very first time in my life. I think I will never forget those three cocoa pods (not three beans, three whole pods of beans) whose pulp I ate or walking through the rainforest and finding a well-kept cocoa farm. Nor will I forget Ermain Requena, who manages the demonstration cocoa farm, cutting some cocoa pods for us to try, his face lighting up full of pride while giving us insights about the farm. I’ll remember hearing from the farmers about the challenges that come with planting and starting a new cocoa farm, and visiting a fermentery for first time. I had the chance to see what fermentation actually looks (and smells) like, and enjoyed learning from two experts who did an excellent job explaining the process to a chocolate maker who was new to it all. “Wet Cacao” ready for the fermentation stage, a stage that can take up to 5-7 days. I can’t adequately describe what it’s like to experience all of this, and the feelings that came with it. To see and feel the hard work, the hopes, and the daily struggles of the producers I met. Those farmers who rely on selling their cacao to have an income, to bring food to their table, to send their kids to school, or to supply the everyday needs of life, who see their future through a cocoa bean, I appreciate the work they do so much more deeply now. You see, we get our bean delivery every week. Burlap sacks over burlap sacks full of beans. Had you asked me about the beans a month ago I would probably had told you some basic facts—the process of cutting a cocoa pod, that the beans’ pulp is insanely delicious, that its fermentation takes up to 5 -7 days, and that even drying the beans can affect their flavor in so many ways. But I would be missing one important thing: the faces and stories behind those beans. Now, I can tell you about those faces and stories as well. Come in and ask me! I started by developing a roast profile, and ended up in places I’d never dreamt I’d be, with people I never dreamed I’d meet. I’m a proud chocolate maker, and I’m a proud Maya descendant. My heroes don’t wear a cap but a hat, a machete, and rubber boots. And they also make possible one of the best experiences your palate can taste: Chocolate. 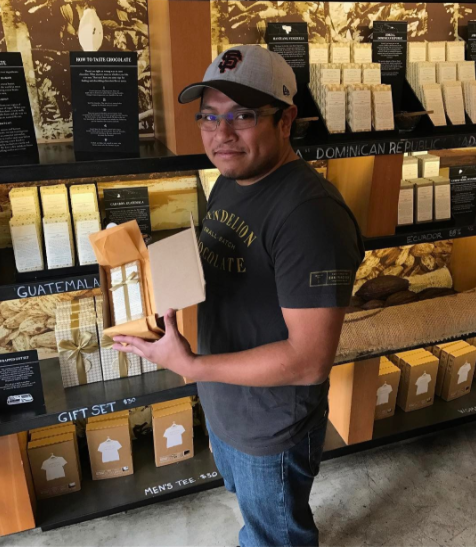 Elman Cabrera, one of our lead chocolate makers, developed the flavor profile (i.e. bean roasting parameters, and more) for the newest harvest of beans from Maya Mountain Cacao, Ltd. 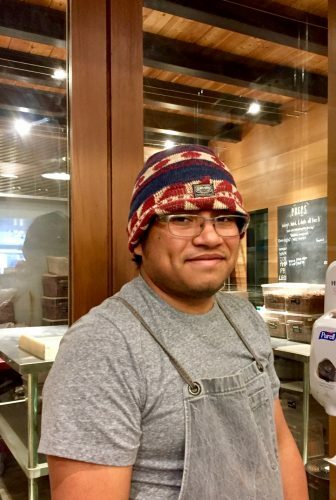 Here, he tells us about what the process was like, and what it meant for him to work with beans that came from so close to home. Our first batch of bars hit shelves a few days ago, so be sure to drop in for a taste! In a few days, look out for the next installment of this story, wherein Elman heads to origin to meet the folks at Maya Mountain Cacao Ltd. who helped produce these beans. I’m Guatemalan. I’m 100% percent sure some Maya blood runs through my veins, and I’m really proud of it. I come from a family of farmers (about half of us are, at least), and as a Guatemalan with Maya roots and a childhood that was surrounded by chocolate, I think chocolate represents an important part of who I am and where I come from. Cacao is and has been sacred to my ancestors for over a thousand years, and I like to think I’m honoring them in some way by working with it, and sharing it with the world. Chocolate is an important part in the Guatemalan diet, so I’ve always been surrounded by it. At home, we often consumed it as a beverage during breakfast or dinner, or to soothe cold nights and sore throats. You’ll also find it in arroz con chocolate (chocolate rice) or chocolate-covered bananas. For a long time, I never dreamt of working with it professionally; I was pretty sure my future lay between lines, erasers, plans, measurements, and designs, and that I was destined to be an architect. I have this wild idea that my ancestors had different plans for me: to walk down the chocolate path. When I moved to the U.S., I had the chance to really work with chocolate for the first time. I took a job working as a machine operator in a truffle-making company, making thousands of truffles each shift and melting hundreds of blocks of Belgian chocolate. It was a glimpse of the pleasure that is working with chocolate, but of course, nothing comes easy, and all it takes is one attempt to temper a huge tank of molten chocolate to realize your dream job can turn into a cocoa butter nightmare. 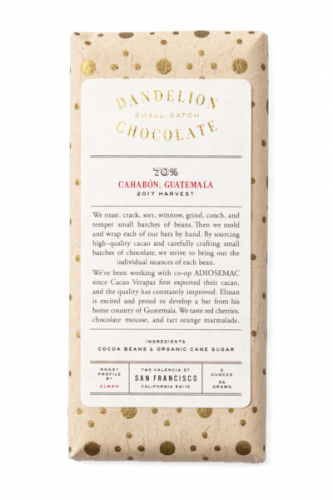 I came to love working with chocolate in that job, but before joining Dandelion, I didn’t realize that it could taste like so many different, interesting flavors. 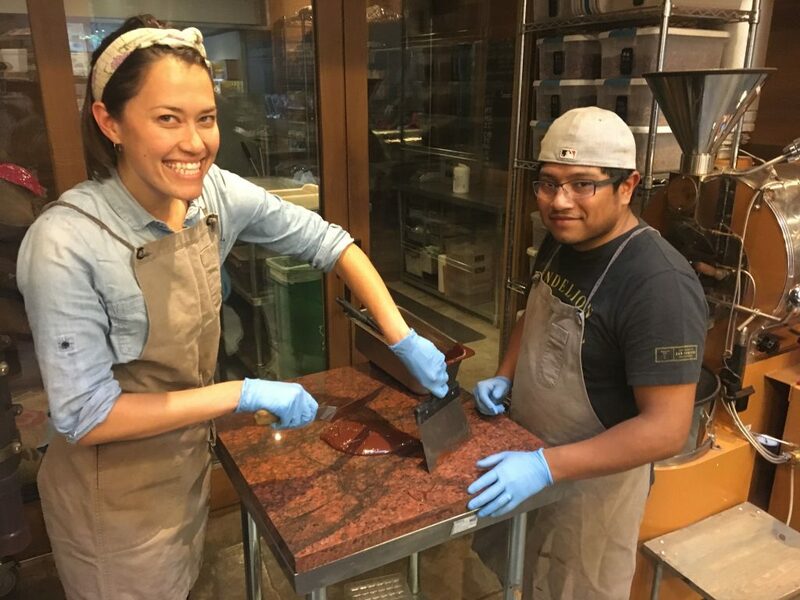 When Karen, my manager, approached me with the offer of developing a new bar profile—making dozens of test batches and designing the final roast profile we would use on those beans—I was excited and happy to have such an amazing opportunity. 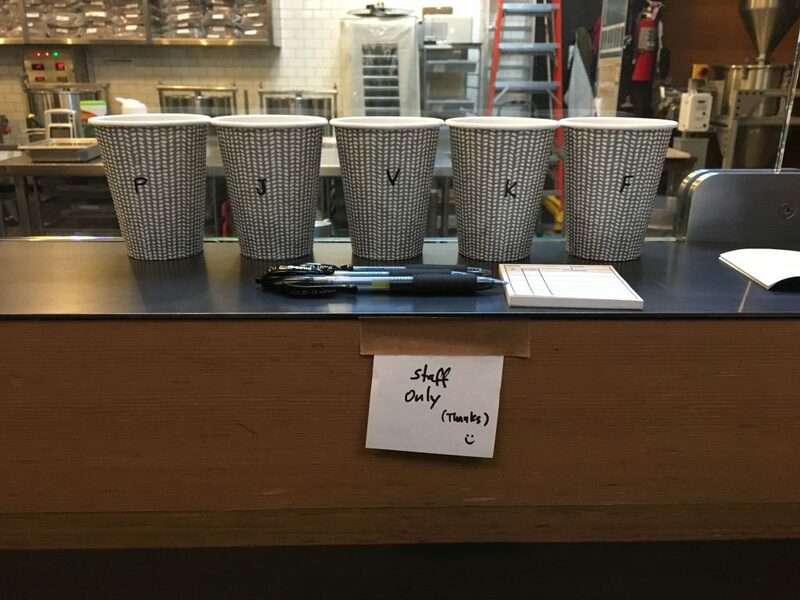 Every time we make a bar from a new batch of beans, someone within the company becomes the “bar owner,” responsible for seeing the test batch process from start to finish, asking for feedback on flavor, and deciding on the final roasting parameters for those beans. Finally, I was going to be able to learn even more about the flavor development of chocolate, and get an even deeper look into the vastness of flavor possibilities that cocoa beans hold. Of course the beans have a natural range of flavors, but these can be enhanced or brought to center stage when we manipulate temperature and roasting time. I discovered that the Maya Mountain beans pack so much flavor in them that I could have taken them in so many different ways, from really fruity to creamy and chocolatey. The flavors that came forth depended mostly on how hot and how long I roasted the beans, and my early trial runs at different temperatures were so different but so delicious. How was I to choose? Running a few taste tests. It is good to have beans that are this versatile, but narrowing down to the flavor you like best from so much variety is also challenging. I ran different sets of tests and tweaking my settings here and there to get to where we wanted to go: a fruity but chocolatey bar. All this was a great learning experience, I bugged my co-workers to taste all of my tests at every stage, and it was incredible to see how palate varies from person to person; someone can get notes of honey or strawberries and cream that you never tasted, but when you taste the chocolate again, that flavor is totally there. In the end, I found the sweet spot: a fairly chocolatey bar with notes of sweet honey, rich caramel, and strawberries and cream. Minda teaching me to temper by hand, like a boss. These beans were such a joy to work with, for their flavor and their story. 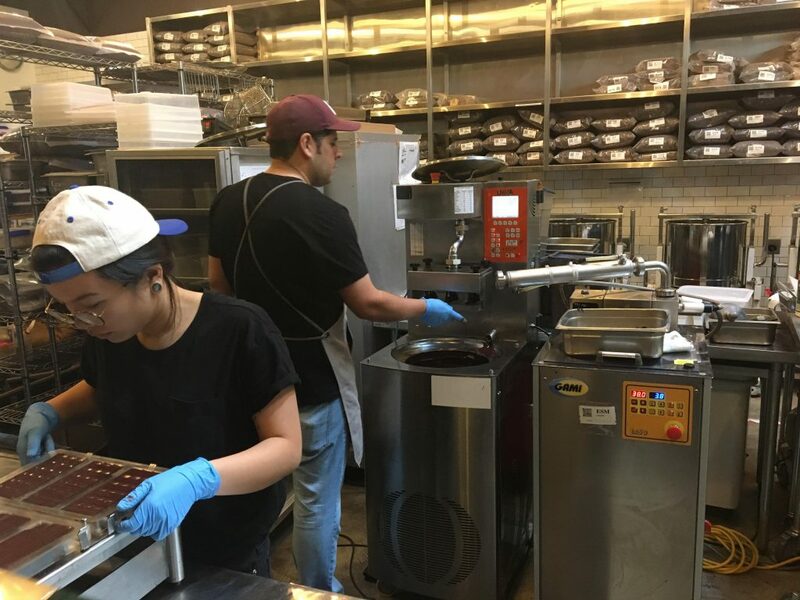 As I made batch after batch of chocolate with them in San Francisco, they transported me south, to Central America, and back in time to the world of my ancestors. I thought my traveling would end there, in my mind, but before I knew it I’d find myself right in the heart of things, among the hills, farmers, and trees that made these beans what they are. But, more on that in my next post. Stay tuned!